Founded in 1995, the main focus of Melett is to help keep the turbo reconditioning industry growing by offering a high quality range of turbochargers, repair kits and turbo parts. This makes repairs possible where the original turbo manufacturer does not fully support the aftermarket. Now after over 20 years of continuous service, Melett has become recognised as the trusted brand for professional turbo repairers and reconditioners worldwide. The company maintained good growth in its first six years until the sudden and untimely loss of Melvyn in 2001. Consequently, the following twelve months brought much uncertainty until the company was bought in 2002 by Mr Ian Warhurst – the current owner and Managing Director. Ian had an interest in engines from an early age due to his family’s garage and haulage company business. After finishing a Mechanical Engineering Design degree, Ian completed further post graduate business qualifications whilst working in the structural aluminium industry. Ian became a Director and Shareholder in the business but after a takeover in 2001, he sold his shares and left. He wanted to set up his own business, and quickly found that Melett was looking for a new owner – and Melett as it is known today was re-launched at Automechanika 2002. In March 2011, further expansion was needed and Melett invested €1.4 million in new and much expanded premises in Barnsley, Yorkshire, UK. This enabled the company to significantly extend its services to customers worldwide. It included improved warehousing, new purpose built offices, as well as dedicated CHRA production and enhanced engineering metrology facilities. To help better serve the Polish market, a sales and distribution centre, was opened in 2013. 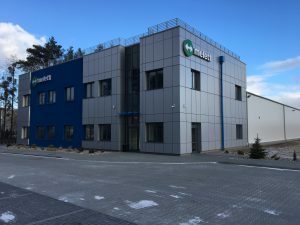 Such has been the success in the Polish market that in November 2016 the team moved to a new larger Melett owned building with over 890sqm of warehouse space. 2016 saw further expansion when additional warehouse capacity was introduced to enhance stock availability. The 12,500 sqm warehouse is adjacent to the existing UK Head Office. It houses; goods-in, quality, inspection and kit building operations.It also accommodates an ever-expanding product range. Mid 2016, saw the launch of Melett Turbochargers. An exciting range of precision engineered turbos. Melett now offers customers the complete product portfolio, including everything from individual piece parts right through to the complete Turbochargers. Melett’s history began in 1995 when the late Melvyn Hackett started the company. Melvyn, formerly of Garrett, worked in the turbo industry for decades initially setting-up and running the European arm of ‘Rotomaster’. They were the largest independent manufacturers of turbo repair parts and were bought out by Garrett in 1985. Melvyn became the head of Garrett Aftermarket for the next 9 years until being made redundant in 1995. Whilst not wishing to retire, Melvyn decided to start his own aftermarket business – naming the company, Melett. Due to substantial growth, in July 2006, Melett moved from its modest premises in Dewsbury to new larger premises in Clayton West, Huddersfield. The new premises incorporated; new offices, mezzanine floor space and extra racking. At the time allowing lots of room for future development and growth. Along with most of its customers, the company developed rapidly in line with market growth. Also, in order to keep ahead of the continuing growth, and to increase product development, stock availability and quality, the company invested heavily in the latest machinery, experienced team members and quality facilities. Further expansion in 2012 saw the opening of Melett North America Inc. The sales, warehouse and distribution facility serves the US and Canadian markets. Expansion continued throughout 2014 after moving the in-house core production facility. This dedicated facility significantly increased volume capabilities. This was followed closely by the launch of a new Melett manufacturing facility in China. As a result, this market move meant the company started to take in-house control of more manufacturing operations.